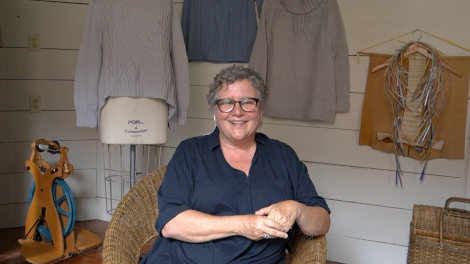 Episode 61 is really exciting, featuring an interview with the amazing knitwear designer Norah Gaughan. 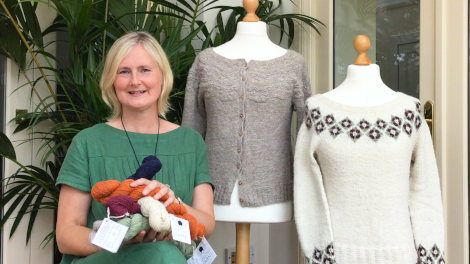 Vogue Knitting has just published a book which showcases a collection of her designs spanning from 1987 until the present. Norah stands out as being very much on the cutting edge of innovative designers. This comes through in her garment shapes, her crazy and beautiful cables and the unusual constructions that she keeps coming up with. Norah also really enjoys teaching and she’s great at explaining the more advanced topics and techniques. Norah does this in our interview, so you’re in for a real treat! On top of this, we go to Scotland for a special ‘Meet the Shepherdess’ segment, we feature a design by Laura Aylor in New Releases and we show off two finished garments in Bring and Brag. 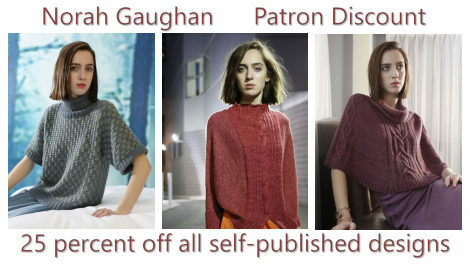 Norah Gaughan is an incredibly accomplished knitwear designer who continues to knock out one stunning and unique design after another. I can still remember the first time I saw a design by Norah, it was the Chainlink sweater from the Brooklyn Tweed Winter 2015 collection and the beauty and originality of the design took my breath away. 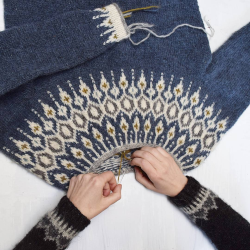 When this happens, it creates such a renewed excitement, thrill and passion for our wonderful craft of knitting. In the interview Norah talks about making the move from a science major to becoming a knitwear designer and the key women who have influenced her journey. 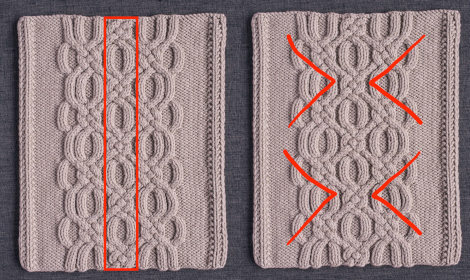 Norah also shares her advice on how to overcome difficulties with chart reading and explains her method of developing variations of stitch patterns based on a simple motive. 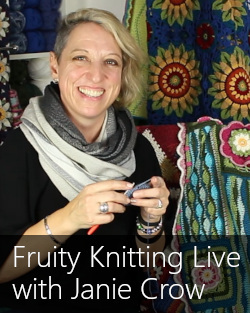 The interview is jammed with amazing knitterly information and helpful advice, you may wish to watch it a few times. Swatches showing the development of new cable patterns. Norah has had her works included in major collections and published in magazines, but she also has her own collection of self-published designs. 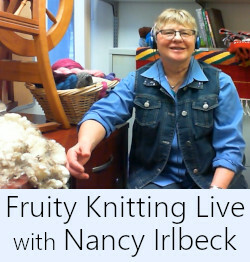 Norah is offering Fruity Knitting Patrons a discount on all self-published designs found in her Ravelry shop. Full details available here. 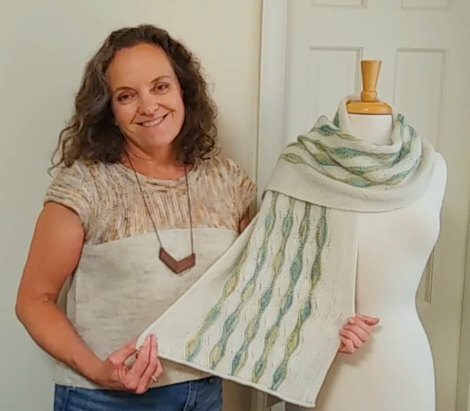 The curves and colors of the Summer Dunes shawl by Laura Aylor perfectly capture the atmosphere of the shoreline grasslands. The technique involves short rows which allows the variegated yarn to pool. This looks beautiful against the sandy tonal background. It’s a great shawl pattern to practice your backwards knitting on. 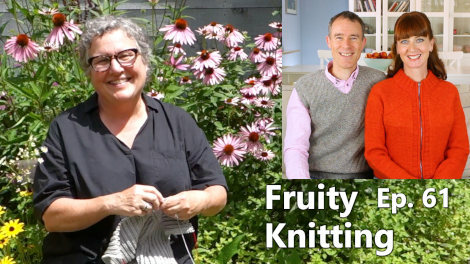 Laura is offering Fruity Knitting Patrons a 30 % discount not just on Summer Dunes but on all of her patterns available in her Ravelry Store. 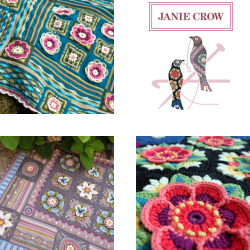 Her collection includes garments and accessories, so there may be a pattern there that is just waiting to be knitted up by you. You can find full details here. 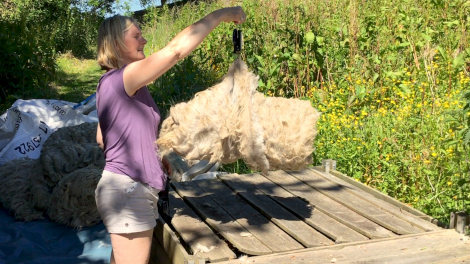 Pauline, the owner of Lifelong Yarns, is very passionate about using the fleeces of the Scottish Blackface sheep that would normally be either burnt or sold at a ‘next to nothing’ price. Pauline is working together with a shepherdess whose farm is just down the road and who happens to be her daughter’s best friend. Together with a local Scottish mill, they are converting the fleeces to beautiful durable yarns for outer garments. The Blackface fleeces are spun either as a 100% yarn or blended with breeds like Southdown, Shetland, Cheviot and Bluefaced Leicester. Below Pauline is helping to skirt, sort and weight the fleeces. 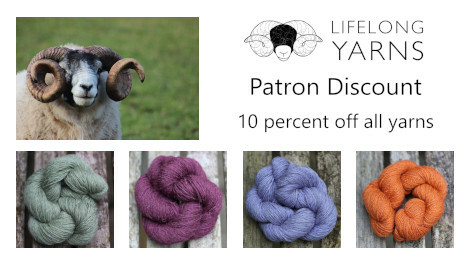 Pauline is offering Fruity Knitting Patrons 10 percent off all of her yarns, set some Scottish Blackface in your hands! This long-staple wool is ideal for outer wear, and providing an alternative for the synthetic fleece jacket was an inspiration for Lifelong Yarns, so this is a great chance to create your own “hiking jacket”. Find full details here. 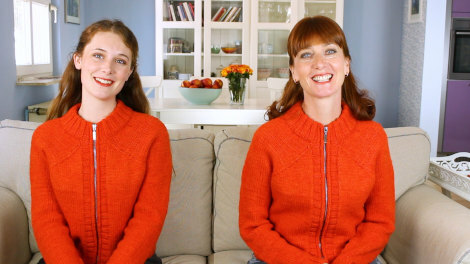 It is a very happy coincidence that I have finished knitting a design by Norah Gaughan in the same episode that we have the privilege of interviewing Norah Gaughan. 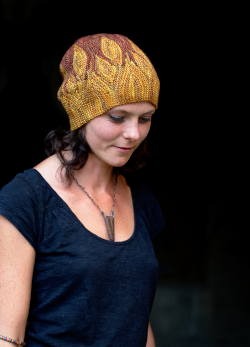 This design was a real pleasure and joy to knit and I love the final result. Despite my success with the Carbeth, I resisted inserting a zipper and have chosen some lovely metal buttons instead which have a similar pattern on them as the pattern inside the lattice cable. I used the Myak Babyak medium in the colour Petrol. It’s 100% baby yak, dyed green over the natural chocolate fibres. It’s been blocked and the yarn has softened and bloomed and I’m extremely happy with it! I have shown a few tutorials on this project in past episodes including how to work the complex cables without a cable needle and there is one more that I want to show you. 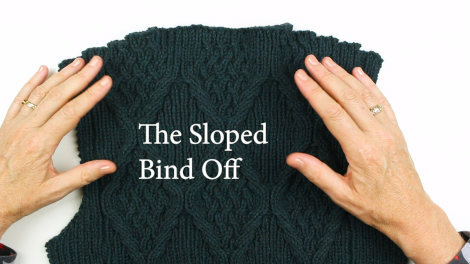 The Sloped Bind Off is an excellent way to bind off edges to make them easier to sew up together. As you can see there was a last minute executive (from Fruityknitting design team) decision done here. The button bands were completed and the icord bind off on the left front band was also done, when Madeleine had the bright idea to insert a zipper instead of buttons. There was a unanimous agreement, so the Carbeth was passed on to Andrea for completion. You’ll have to watch the episode for details on how the zipper was inserted! We talked to the Yorkshire Wildlife Trust about their conservation grazing in Episode 10. 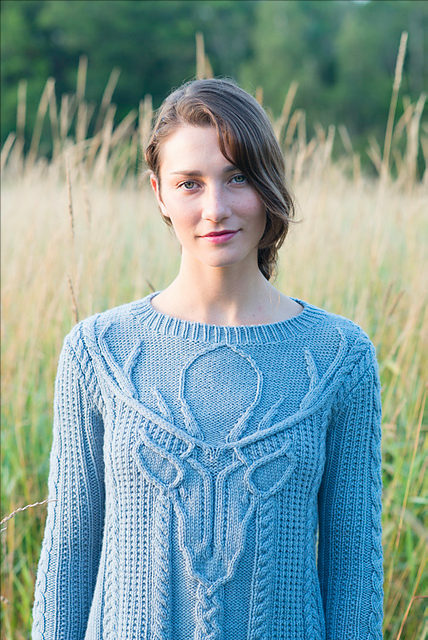 Andrea is starting the Traígh by Jade Starmore as her garment for the Knit for Your Man KAL. I agree with Andrea’s theory that if she is going to make something for me, it may as well be spectacular. We’ve both admired the Traìgh design for sometime. The name comes from the Gaelic word for the low-tide sandy beach, which is a beautiful image. The blue colorway in the Virtual Yarns wool is stunning, so I’m really looking forward to it. It is great to see that we already have a huge participation on the KAL thread. Knitting for someone else has its own special challenges, so the KAL should provide a good support group! 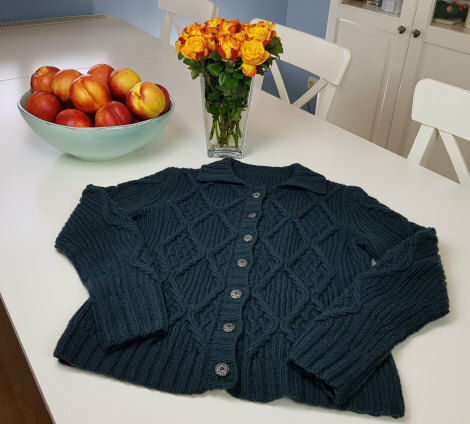 Hello Andrew, I thought that initially you started knitting the Carbeth cardigan for Madeleine and she looks super in it. It should be a gift for her from Daddy. Always special. With very best wishes Jocelyn P.
Hello! Thank you for these notes. 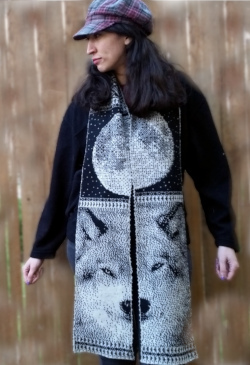 I am really interested in learning how Andrea modified the neck on the Carbeth cardigan. I like this better than original patter. Please stear me to where I can find the info for the neck. Thank you as always. Hi Lynette. 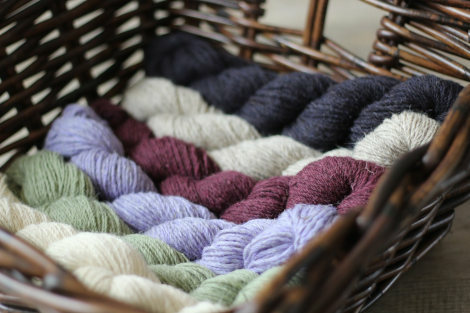 Andrea talked about adding the short rows in Episode 60, so hopefully that will help. Thanks for watching. Who should get the cardigan? Well that is easy. Both. Andrew you just will have to make another one. The second one will go so much faster and you can practice the more difficult parts like short rows and putting in a zipper. You are a Pro now. Piece of cake. Of course the sweater belongs to Madeleine it was made for her, so why should Andrea think she should take it? Rather disingenuous if she does.Surely you have enough sweaters already Andrea? Your daughter should collect on the special gift she was given to expect, Why has the question even arisen? The sweater belongs to Madeleine! Hi Sue. It is all a bit of fun, nothing serious. Of course Madeleine will get the cardigan and Andrea has also already knitted her about 5-6 sweaters/cardigans. Just a bit a friendly family teasing. Hi I’d like to know how Nora adds in more yarn to her project ?